Po wygranej w Johannesburgu gracz z RPA osiąga swój nowy rekord rankingowy. Kevin Anderson zagrał wczoraj w swoim 2 finale turnieju ATP. Poprzednią potyczkę o tytuł zawodnika z RPA przegrał, a miało to miejsce w Las Vegas w sezonie 2008. Kevin Anderson hoists his first ATP World Tour trophy at his hometown tournament. hometown tournament, the SA Tennis Open in Johannesburg. ATPWorldTour.com caught up with Anderson after he rallied for a 4-6, 6-3, 6-2 win over Indian Somdev Devvarman. How does it feel to win your first ATP World Tour title in your home country? It’s an amazing experience. Obviously just winning my first title is one thing, but doing it in front of my home fans and my country with my friends and family watching is something I’ll remember forever. You played Somdev in the US Open last year and also in college. What was your game plan going in? Somdev is a tricky player. He plays so well, he fights so hard, there’s never an easy point. But from the US Open I think I learned one or two things and today I just wanted to really go out there, be aggressive and play on my terms. You played the final in Las Vegas in 2008. Did you come into this final with a different approach? Not really. I really just tried to come out there and play my game. I think being in a final before sort of settled my nerves a little bit. Even though I was a little nervous starting out this match I was able to overcome it and I think being in that position before definitely helped me a lot. You’re off to your career-best start this season in the first six weeks of the year. Have you done things differently from the past? I don’t think necessarily differently as opposed to just continuing what I’ve been working on and obviously it’s the beginning of the year, but in terms of my development, it’s part of a long process so continue to work hard and hopefully I’ll be able to have more results like these. Is there anything you did differently during the last off-season to your game. Not really. Just learned a lot from what I wanted to improve on a little bit. It’s the same kind of things I’m trying to practice on during tournaments. I have a longer space to do it in. I think I was able to practice well and I think the results are kind of showing that. Now that you’ve cracked the Top 50, what are your goals for the rest of this season? My end of year goal is to finish the year in the Top 20. Obviously it’s a good start, but there’s still a lot of tennis to be played and it’s just important to recognise the accomplishment this week and build in confidence for the rest of this year. Who are the players you admired growing up and did your pattern of game take after them? I always looked up at Sampras and more recently Federer and Nadal, just the way them handle themselves and how great they are for the sport. It doesn’t really reflect too much on my game, although I am trying to become more aggressive, so I guess I look at Federer and learn a lot of his patterns of play. I try and learn what I can from him. Who’s helped you get where you are today in your career? Definitely my family – my mom, my dad and my brother. My brother played as well. Growing up they gave so much to help me get to where I am. They’ve continued to play a really important role where I am right now. To Lui my coach, whose been working with me for about a year now, he’s been a great part. To my fiancée in Chicago, who’s really supported me and given me just a lot of backing. With three South Africans getting to the quarter-finals this week, what do you think of the state of the game in your country? It’s great. We have some really good players. It’s just great to give everybody an opportunity to play and sometimes that’s tough. A lot of players around the world get to play in their home country, in front of their home fans, and not to say it’s easier, but it’s definitely nice having that feeling. I think everybody was really able to capitalise on that this week. Kevin Anderson saved both break points he faced. Two-time defending champion Andy Murray made a hasty exit from the Rogers Cup in Montreal Tuesday, beaten 6-3, 6-1 by 6' 8" South African Kevin Anderson. The last defending champion to lose in the opening round in Canada was Marat Safin in 2001. Despite the loss Murray will remain No. 4 in the South African Airways ATP Rankings, but by dropping 1000 points he will see a widening in the already significant gap between he and No. 3 Roger Federer. It is Murray’s third consecutive opening-round loss on North American hard courts at ATP World Tour Masters 1000 level tournaments this year following surprise defeats to Donald Young in Indian Wells and Alex Bogomolov Jr. in Miami. Murray had turned around his rollercoaster year mid-season when he reached semi-finals in Rome and at Roland Garros before winning Queen’s and reaching the Wimbledon semi-finals. Murray was at a loss to explain his performance, saying that he believed his preparation - 10 days off after Davis Cup followed by two weeks of training in Miami - was to his liking. "Sometimes you can make mistakes with your preparation, but I've done pretty similar stuff to what I've always done coming in here. It's just a really bad day. It's happened to me a couple times this year and also last year, as well. "I just felt very slow. Today I couldn't get anything going. I started both sets really, really badly which doesn't help against someone that serves like Kevin. Every time he came to the net, I was a bit late getting to the ball. I was getting behind very early in all of the rallies and didn't move particularly well." Anderson, whose first ATP World Tour title came on home soil in Johannesburg in February, said that he was surprised by the ease of his victory. "It was probably not exactly what I was expecting. At the same time I think some of the way I played, the way I served today, I think I did make it pretty tough for him. I felt I came forward very well and I executed very well. "I've played him a couple years back and he beat me pretty bad. I knew what I had to do today. I thought I came out and played really well, played the way I wanted to play. It feels great, obviously. He's a great player." Anderson, 25, has now won 29 matches this season, more than doubling his previous best tally of 14 wins in 2010. He reached the quarter-finals of the ATP World Tour Masters 1000 tournament in Miami in March. The three-time All-American at the University of Illinois is currently No. 35 in the South African Airways ATP Rankings, just two places below his career-high mark of No. 33. South African Kevin Anderson, who knocked out two-time defending Rogers Cup champion Andy Murray on Tuesday in Montreal, responds to questions submitted by Facebook fans. I definitely think I move well for being taller. I work pretty hard at it by doing a lot of movement baseline drills. The first step is really important, so that’s something I work on a lot. I spend a lot of time doing tennis specific movements. You had three great years at the University of Illinois. Do you have plans to complete your studies and why might college tennis be a good option for some guys who clearly have the talent to one day play on the ATP World Tour? I’d love to go back. I turned pro my junior year, so I have 1.5-2 years of studying left. I think college is a great option. There are a lot of good tennis players. The whole setup is very conducive to improvement for a tennis player. You get your matches in the spring competing against other players and in the summer, you can go play all the pro tournaments in the States if you want. For me it was an excellent option and I highly recommend it to those people who feel they need to develop more before turning pro. Well, hopefully I will… that’s my first pick. Djokovic has had an incredible year and will be extremely motivated for it. I think Nadal and Federer will be as well. I mean there are a lot of great players and it will be an interesting tournament. That’s why I think the US Open is one of the most exciting events. This year for me, Djokovic has been the toughest guy. I guess I’m not the only one who would say that. I’ve played him three times this year and he doesn’t give you anything. He makes it really tough for you. Everybody on tour is pretty friendly. We spend so much time with each other, basically the entire year, so I think overall it’s a friendly atmosphere. I definitely feel comfortable playing in the US. This is one of my favourite places to play outside of South Africa. Being here for 6-7 years now, I feel I’m getting some support in the States. The environment from Illinois, we had such a tennis loving community. Sometimes some guys will come watch me play, which is a lot of fun for me. That’s always a tough one to answer. I look at them as fellow competitors, people I want to beat when I go out there on court, so I wouldn’t say I have a favourite. But I do admire a lot of the achievements the top guys in our sport have done. Whenever you get a Top 5 win, it’s truly special. It would be great to beat all of them. I’ve defeated two of them (Djokovic and Murray). I have three more to go so hopefully it won’t be too long until I’ll be able to do it. Sampras. Even though my style of play isn’t modeled after his at all, I just think the way he handled himself, his demand for excellence and his achievements were unparalleled at the time. He gave me a lot of motivation. My year-end goals are to finish in the Top 20. If I was able to do that by the end of the US Open, that would be a great achievement for me. It’s something I would definitely take if you gave it to me beforehand. It will be a lot of hard work, a lot of big tennis matches I’m going to have to win. I just love playing this time of year and will take it one match at a time, giving it my all. Do you talk much with fellow big guys Karlovic and Isner, swapping stories about cramped airline seats and short hotel beds? It’s kind of funny. I get so many questions about my height and I’m sure those guys do too. When we are together, we almost avoid the issue completely. Yes, I am playing. We’re playing in South Africa, in Potchefstroom. Really looking forward to it and hopefully we can get back into the World Group. Kevin Anderson is one of the tallest players on the ATP World Tour at 6’ 8’’. But the South African has soared to new heights in 2011, winning his first ATP World Tour title in Johannesburg and achieving a career best ranking of 33 in April. The 25 year old defeated Xavier Malisse 6-3, 7-6(6) in a first-round encounter at the Western & Southern Open on Tuesday to notch his 30th win of the season. ATPWorldTour.com caught up with Anderson after his victory against the Belgian in Cincinnati. With your breakthroughs this year, winning the title in Johannesburg, and elevating your ranking inside the Top 35, you’re now in a position to play all of the ATP World Tour Masters 1000 events. What’s it like to be able to play these important tournaments on a regular basis? This is why I play tennis. To be able to play at this level at the large events with the top players is definitely great to be part of. At the same time, I think it’s improving my tennis and ultimately want to feel like one of those top guys, where people say the same thing about playing at tournaments with me. Last week, you had an upset win over World No. 4 Andy Murray in Montreal, your second career Top 5 victory. What does that performance do for your confidence for the rest of the North American hard-court season? I played a great match against Andy. Obviously he’s a terrific player and has had amazing successes, so it was very good for me to win a match like that. It was one of the best matches I’ve played. Beating someone ranked as high as him definitely ranks up there as one of the top three wins of my life. I’ve taken a lot of confidence out of that and will hopefully be able to produce more results like that in the future. With eight great months so far this year on tour, what goals do you have for your year-end finish, knowing there is still plenty of tennis to be played out? At the beginning of the season, I said the goal for myself was to finish inside the Top 20. I think that’s a realistic goal for me, setting a good platform to hopefully get higher. I think there are a lot of guys who are playing well right now, so it’s not an easy goal. I think I’m in a good position to achieve it and I’ll be satisfied with more match wins and playing consistent tennis the rest of the year. If you had time to go to Kings Island, do you think you would be able to fit in one of their roller coasters? Haha, I was just thinking the same thing! I know there are minimum height restrictions but I don’t think I’ve ever heard about a height cut off. I haven’t been on one since I was very young back in South Africa, so maybe if I have some spare time, I’ll head on over there to find out. (or better) this year on Wednesday. 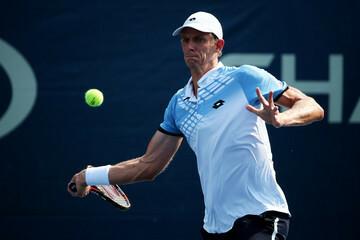 Fifth seed Kevin Anderson reached his seventh ATP World Tour quarter-final (or better) on the season by beating German wild card Tommy Haas 6-7(3), 6-4, 6-4 in just over two hours on Wednesday at the If Stockholm Open. It was his 37th match win of the year, highlighted by lifting his hometown title, the SA Tennis Open, in Johannesburg (d. Devvarman). Kevin Anderson and his wife met at the University of Illinois. South African’s Kevin Anderson married his college girlfriend Kelsey O’Neal in Willamette, Illinois during a private ceremony on Saturday 10 November. The couple have since gone on honeymoon to Miami and St. Lucia. Anderson met Kelsey met five and a half years ago during college at the University of Illinois, where he was a member of the tennis team and Kelsey was on the golf team. Their wedding reception took place at the North Shore Country Club in Glenview, Illinois, where Kelsey’s father is the golf pro. "It was just an incredible weekend, especially having friends and family coming from all over the world to be a part of our special occasion," said Anderson. "Illinois has become my home since leaving South Africa; it was where I went to college and where Kelsey and I met. It was the most special day of my life." The 25-year-old Anderson finished the 2011 ATP World Tour season at No. 32 in the South African Airways ATP Rankings, having reached a career-high World No. 30 on 10 October. In a career-best season he put together a 42-27 match record, highlighted by winning his first ATP World Tour title in his hometown of Johannesburg (d. Devvarman). Kevin Anderson z RPA, obecnie 32. tenisista w rankingu ATP World Tour, poślubił koleżankę z college'u Kelsey O'Neal. Ceremonia odbyła się w Wilmette, w stanie Illinois. Para udała się teraz na miesiąc miodowy do Miami i Santa Lucii. Poznali się pięć i pół roku temu podczas studiów na Uniwersytecie w Illinois, gdzie O'Neal trenowała golfa. Jej ojciec jest zawodowym graczem w tej dyscyplinie sportu. 25-letni Anderson najwyżej był notowany na 30. miejscu na świecie 10 października. Ma za sobą najlepszy sezon w karierze, w którym wygrał 42 mecze i doznał 27 porażek. W styczniu odniósł pierwsze zwycięstwo w imprezie rangi ATP World Tour przed własną widownią w Johannesburgu. Zarobił dotychczas na korcie 774,4 tysiąca dolarów. Kevin Anderson won his first ATP World Tour title at Johannesburg in February 2011. Respected by his peers for his relentless work ethic on and off court, Kevin Anderson is giving South African tennis fans reason to cheer again. Once upon a time, South Africa was a nation rich in tennis players. They had their legends - Cliff Drysdale, Johan Kriek and Kevin Curren - who on any given day could rule the tour. For South Africa it was the best of times. On their heels came the 'Super Squads', wolf pack teams of the country's elite players, who were sent on missions to conquer the tennis world. Soon, there were 14 players ranked in the world's Top 100. Tennis was so good in South Africa that they even had a tour called, The Sugar Circuit, a series of ATP Challenger tournaments, strung out along the South African coastline, where a man could strike gold in the form of ranking points, without ever even boarding a flight. Then, one day, change swept across the nation. "When I was around 14 years old, I remember watching local televised events in South Africa, which had the likes of Lan Bale, David Nainkin, Piet Norval and Neil Broad," recalls Kevin Ullyett. "They were all still in the juniors then, but competing with the top South African men of that time. From that came the likes of Wayne Ferreira, Marcos Ondruska and Grant Stafford." "Their life was a dedication and commitment to tennis day by day"
But the Tennis gods would not rule in favour of South Africa. Rather than continued blessings, a curse would rain down on the country. The rand, South Africa's currency, would begin to devalue making international travel for its players extremely difficult. Tournaments began to disappear and so did the rich supply of tennis players. But a new day has dawned on South Africa, and all things considered tennis fans have reason to smile again. A new breed of players like Rik de Voest, Izak van der Merwe and Raven Klaasen are making their mark on the ATP World Tour. One standout star is Kevin Anderson. Armed with a hard-work ethic and a big-gun serve, Anderson has climbed his way up the ladder into the Top 30 of the South African Airways ATP Rankings. The big man from Johannesburg has made it known that he is a clear and present danger at the majors. His story features a familiar plot in tennis; a driven father who dreams that his boys would use tennis as a vehicle to prepare them for a better life. In the words of Anderson's mother, Barbara, "their life was a dedication and commitment to tennis day by day." The Anderson family story of success is one that never tires the true tennis fan. It all started with a simple piece of string and an old tennis ball. A contraption that they called appropriately, Swingball. Quickly, the two little brothers became experts. They would soon outgrow the primitive game, so their father, Michael, went to work building a wall for his two sons, Kevin and Greg. It was the countless hours - no, days, weeks and months - of hitting against the wall that the dream was borne. "(Mike) was their constant companion and coach on the tennis court," says Barbara Anderson. "Often there were times when Mike had to literally pick them up off the court as each brother had wanted to hit the last winning shot." It is late Christmas Eve in the Anderson home and Michael Anderson is thumbing through the pages of a tennis instruction book preparing the next days' practice session. "I remember that dad had this book that was falling apart and he had cellophane tape holding the pages together he had used it so much," remembers Anderson. "It was Total Tennis Training, by Chuck Kriese. That was the book that he read the most." And total tennis training his boys surely got. Next morning, Christmas Day came early for the Anderson boys at 7 a.m. Except they did not look under any trees for presents, but rather across the net from each other. Any gifts that they got on this morning would come in the form of a tennis ball. "College tennis was one of the best times of my life"
"The children used to practise at their school, Saint Stithians College," remembers Barbara Anderson. "It was Christmas Day and Kevin, Greg and Mike were on the court. Their grandmother and I were on the sidelines picking up balls. Then, all of us sat down to our Christmas lunch, courtside, of watermelon. The day finished at about 4 p.m. Then we enjoyed our Christmas dinner in the evening." "My dad used to play a bit himself," says Kevin Anderson. "He was self taught, read a lot of books, watched a lot of videos. He has played the biggest part of my tennis career. Growing up if the practice was two or three hours, we would often spend the first hour just doing footwork and shadow strokes. We spent a lot of time swinging in front of the mirror. I still do it today. Especially, if I want to work on a few things." The years would pass and by all estimates Kevin had a solid junior career. But he was not ready to make the jump to the professional tour. So he took a safer route and accepted a college scholarship from the University of Illinois, where he was coached by fellow South African, Craig Tiley. Anderson would earn various honours in the US collegiate system, but the real goal for the Anderson was to make his mark on the ATP World Tour. "College tennis was one of the best times of my life," claims Anderson. "Kevin went the route that some South Africans take and that is to go to a US college for a couple years," says Ullyett. "I think most South African tennis players are late developers and have their best results in their career mid to late 20s. Kevin and Wes Moodie prove that well as when they hit the tour they seemed mature and had a good base from the college years." John de Jaeger, South Africa's Davis Cup captain, has known Kevin since he was a teenager. "I knew when he was still in the juniors that he was going to be a great player," says de Jaeger. "He had the work ethic, the mind and the weapons." It is the topic of work ethic that keeps coming up when Anderson is discussed. "I feel that every day is an opportunity to get better"
"I remember, once, at a tie with the Netherlands, which we were in playing in Potchefstroom, South Africa," begins de Jaeger. "It was winter and very cold. The team had already finished practice and Kevin, the mental coach and I were walking back to the hotel when Kevin said he did not feel comfortable with his serve. He said he wanted to practise more. So we went back to the courts and Kevin practiced his serve for another 45 minutes. Kevin will go all the way to do any work that will make him a better tennis player." Fellow South African and Davis Cup teammate Rik de Voest agrees with de Jaeger. "He (Anderson) knows what works for him and he gets it done," de Voest says. "He is extremely disciplined in his routines and practices. He knows that a serve alone will not win him matches, and he has worked a lot on his movement and ground strokes." "I am pretty structured," admits Anderson. "I feel that every day is an opportunity to get better. I take pride to work hard. Overall, it is a fairly consistent balance between sharpening my strengths and improving my weaknesses. However, in matches I am trying to work on letting that creative side come out more." It is the 2011 China Open and Andy Roddick and Anderson are set to meet in a couple of hours in the first round. Like most players before a match, Anderson is in the gym. But not the gym at the Beijing Olympic Green Tennis Center. Rather, the EyeGym, an online visual training program. "If (Kevin) feels that it will get him just one per cent better, he will do it," says Anderson's coach Louis Vosloo. "His attitude for improvement is almost unparalleled. We have more of a problem with him doing less than doing more. To give you an idea of Kevin's dedication to tennis, last week in Auckland [at the Heineken Open], we were on a mission to find some special type of vinegar because it will help his digestive system. We were driving all over the place, in a little rental car, looking at several maps. What I would like to say is that Kevin will do whatever it takes to be the best he can be at every level." These days, Anderson has found himself between a rock and a hard place. Embedded in his subconscious is the belief that only extreme hard work will produce improvement. Sheer hard work got him to this level. "From a young age it was instilled by my dad that we need to work hard to achieve our goals," says Anderson. "But nowadays, I have to monitor my training and make sure I don't overdo it. But at the same time you have to put in the work. I don't think that there are any shortcuts. There is a fine line between continuing to work hard and also being smart with your body." "Times like that you don't really need to say anything"
"He is used to practising four hours per day," says de Jaeger. "But now, with his knee problems, he is going to have to get away with two hours. He will have to be very smart how he handles his body." "He does a lot of goal setting and has high motivations for achieving them," says Vosloo. "The best part of working with Kevin is his ability. It is gratifying when you do work on certain aspects of his game and over time and they become a reality. Kevin is still a way from his ceiling. He is more comfortable about where he is on the tour, and that he belongs where he is at. I don’t think that he is someone who has overachieved his ability. I think that he is someone who will go much higher." Anderson proved last year at his hometown tournament, the SA Tennis Open, how high he could go by winning the his first ATP World Tour singles title. "There was so much time and effort when we were kids that winning the title was really gratifying," confesses Anderson. "My dad watched at home on the TV, only a few minutes away. We spoke immediately afterwards. It is one of those things where you don't have to talk a whole lot, because you know all the things that went on behind the scenes. So much time has been spent and the emotions were very high. Times like that you don't really need to say anything." Says Ullyett, "South Africa is crying out for a tennis star and I think Kevin has a chance of revitalising the kids there to go and hit balls. He shows them that you don't have to be a world beater at 17 years old or bleeding your parents dry financially at an academy. You can work hard in your own time, finish your schooling normally, even study in the United States and still have 10 years out there on tour. Kevin epitomises the phrase, 'It's not how you start, it's how you finish.'" It has been 18 years since Anderson won his first trophy in Playball, a balls skills and mini-tennis program, that little he was enrolled in with his brother. An infinite amount of hours and shadow strokes later, it is his father's turn to be proud of a job well done.